American soldier; born in the province of Brandenburg, Prussia, Sept. 28, 1827; died at Baltimore Aug. 12, 1876. He was the son of Abraham and Sophia Blumenberg, and the twenty-first of a family of twenty-two children. Soon after his birth Blumenberg's parents moved to Frankfort-on the-Oder, and at an early age he was graduated from the gymnasium of that city. He served in the Prussian army in the Danish war of 1848, enlisting as a private and being promoted to the rank of first lieutenant. He was decorated for his services, but the anti-Semitism prevalent deprived him of his medal; and, resenting such treatment, he left for America in 1854, settling in Baltimore, where he was engaged in mercantile pursuits until 1861. When Fort Sumter was attacked Blumenberg assisted in organizing the fifth Maryland infantry regiment, of which he was commissioned major. His efforts for the Union cause won for him the hatred of the Secessionists, forcing him to be guarded constantly to prevent their attacking and hanging him. He first served near Hampton Roads, was later attached to Mansfield's corps in the peninsular campaign, and commanded his regiment as colonel at Antietam, where he was severely wounded in the thigh by a sharpshooter. This ultimately caused his death. He returned home, and was confined to his bed for several months. 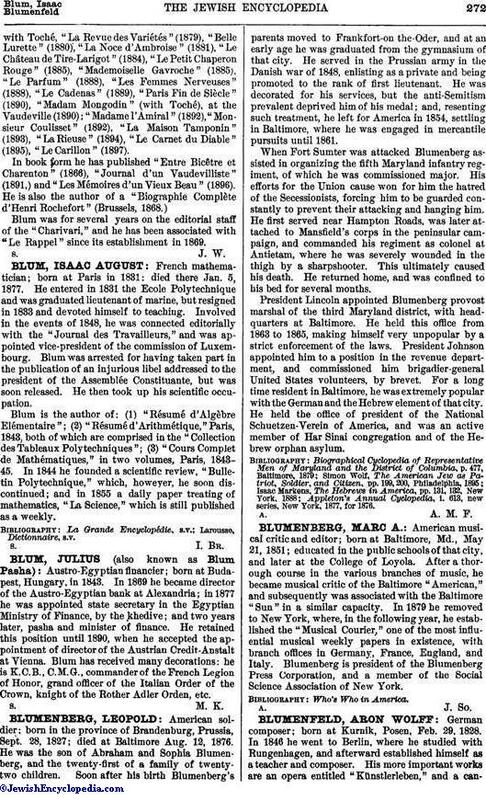 President Lincoln appointed Blumenberg provost marshal of the third Maryland district, with headquarters at Baltimore. He held this office from 1863 to 1865, making himself very unpopular by a strict enforcement of the laws. President Johnson appointed him to a position in the revenue department, and commissioned him brigadier-general United States volunteers, by brevet. For a long time resident in Baltimore, he was extremely popular with the German and the Hebrew element of that city. He held the office of president of the National Schuetzen-Verein of America, and was an active member of Har Sinai congregation and of the Hebrew orphan asylum. Appleton's Annual Cyclopedia, i. 613, new series, New York, 1877, for 1876.